Eaton’s boys and girls cross country teams celebrated winning team titles at the Eaton Invitational on Saturday, Sept. 15. 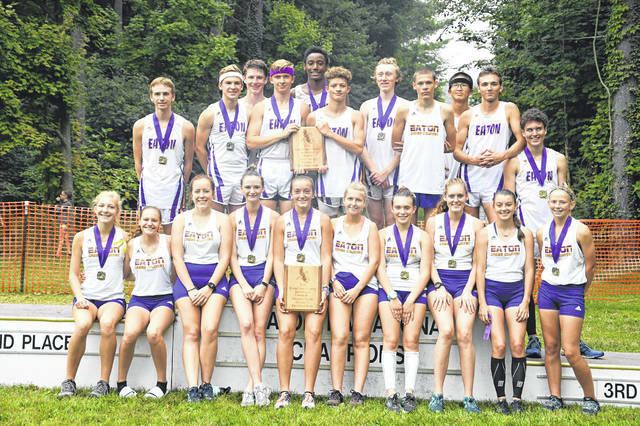 EATON — Eaton Cross Country coach Randy McKinney thought his boys and girls teams had a chance to pull off a rare sweep at the Eaton Invitational last weekend. His team proved him right as the girls claimed their first title in some time and the boys added to their recent success. 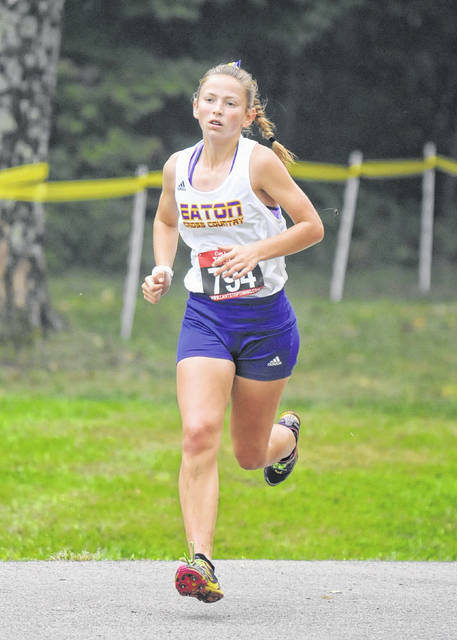 The girls team placed three runners in the top 10 and finished with 48 points, while the boys placed four in the top 10 and totaled 29 points on Saturday, Sept. 15, at Fort St. Clair Park. Monroe’s girls were second with 69 points and Celina was third with 73. On the boys side, Badin was second with 49 and Milton-Union was third with 118. McKinney said the girls ran an outstanding team race, placing all seven runners in the top 20. Ali Mowen (22:13.0), Claire Meyer (22:13.7) and Brooke Caplinger (22:31.4) had great finishes with 7th, 8th and 9th place finishes respectively, according to McKinney. The next four girls that worked well together during the race to pull one another along were Briana Baker (11th, 23:12.5), Cari Metz (13th, 23:35.6), Alexis Owen (14th, 23:39.6) and Rachel Buckler (20th, 24:03.2). On the boys side it was almost a carbon copy of the girls. The boys placed the top seven in the top 20 places, 11 in the top 29 places, captured the team title and set many personal season and career best times, according to McKinney. 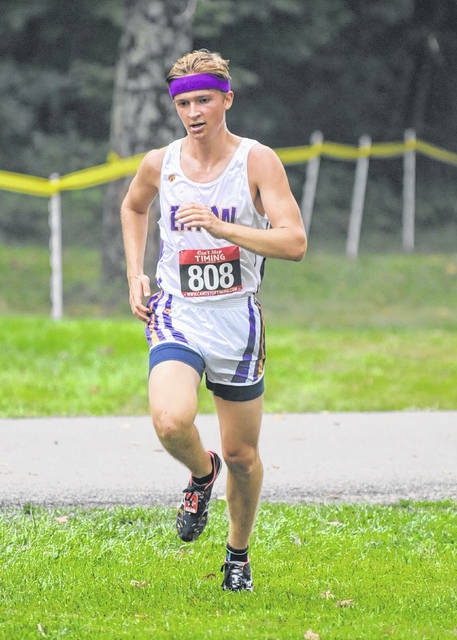 Alex McCarty (1st, 16:52.8) ran an outstanding race taking charge at the 1 1/4 mile point on the course easily cruising in 20 seconds ahead of Nathan Thobe of Middletown Madison. Eagle teammates Alex Newport and Jack Bortel worked well off one another during the entire race with Newport (17:22.9) finishing 4th and Bortel (17:23.2) finishing 5th overall with less than one second separating them, according to McKinney. McKinney added, Dylan Suding (18:04.2) and Todd Coates (18:09.0) continued to work well together during the entire race placing 11th and 12th respectively less than five seconds apart. Cole Bulach (18:33.4) and KeAnthony Bales (18:36.5) ran great races to finish up 19th and 20th respectively less than three seconds apart. The junior high girls captured the team title by placing seven runners in the top 20 places. Kierra Elliott captured the individual title with a first place finish in 13:30.2 . The junior high boys team place 8th overall with Kolby Hamilton leading the way for the eagles with a 7th place finish in a time of 12:32. 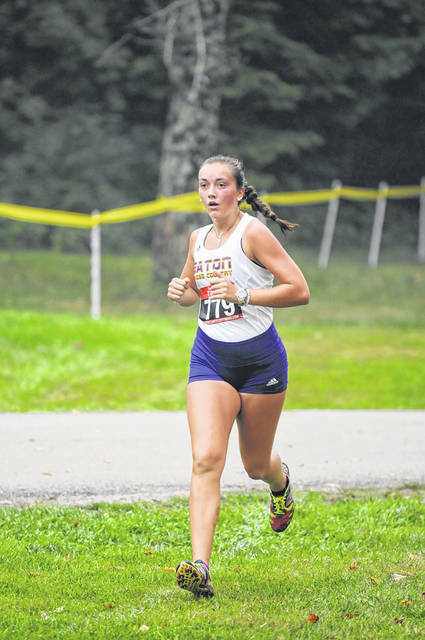 Other girls high school finishers were Alaina Webb (34th), Laura Clyburn (35th), Arica Hamilton (37th), Elaina Maynard (40th), Ashlynn Conley (42nd), Grace Risner (56th), Nina Albinus (59th), Katy Rich (76th), Maddie Meredith (80th) and Jacque Owen (41st, reserve race). Junior High girls finishers: Rylie Haynes (6th), Kaili Hewitt (8th), Stephanie Gibson (9th), Ali Schmidt (17th), Cami McCloud (19th), Kendall Miller (20th), Kalah Stuart (34th), Anna Betscher (38th), Katie Hauser (56th). Junior high boys finishers: Jaxon Roth (44th), Bradley Gifford (46th), Charlie Roth (52nd), Nick Laycox (95th). 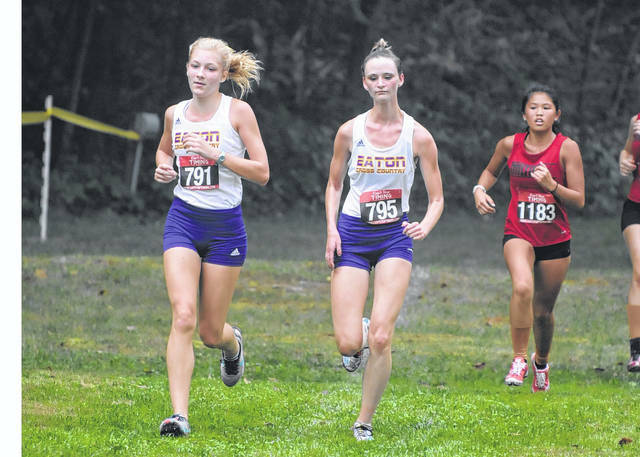 “I believe our invitational offers a unique and exciting Cross Country atmosphere for both the athletes, coaches and spectators alike that is tough to find at any other meet during the season. We are lucky and blessed to have Fort St. Clair as our home course. The City of Eaton just does an outstanding job helping provide a quality facility for our program and all the teams that attend from across Southeast Indiana and Southwest Ohio,” McKinney said. “I didn’t know whether the new downhill and the new trail through the woods would speed up the course, slow it down or if it would run about the same time wise. I believe it actually slowed the course down in comparison to the past course, but that speaks to the effort and the focus of both the boys and girls teams. We had a great morning to race with the overcast skies, but our athletes had to deal with the high humidity which I believe was a factor for everyone racing throughout the day. 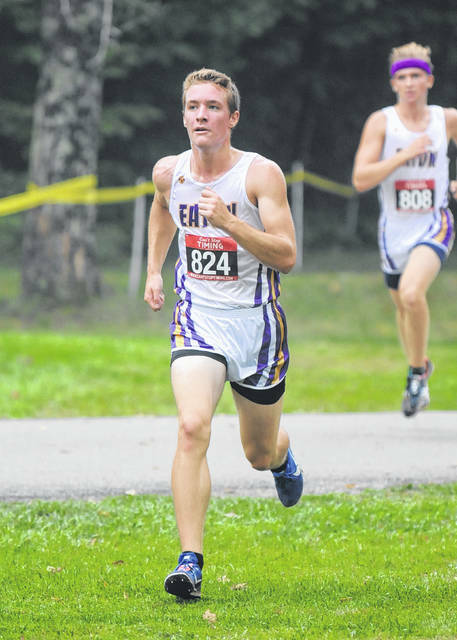 https://www.registerherald.com/wp-content/uploads/sites/41/2018/09/web1_ehscc1.jpgEaton’s boys and girls cross country teams celebrated winning team titles at the Eaton Invitational on Saturday, Sept. 15.